Jayalalitha’s conviction in the 16 year-old disproportionate assets case has been celebrated as a triumph of justice by her detractors and the aam aadmis of our country. The high profile case which was moved to Bangalore in 2001 and saw 4 judges come and go was ridden with drama and would be remembered for its many firsts – the first judgement against a sitting Chief Minister, the ruling of Rs.100 crore as fine and so on. Needless to say, the days following the judgement saw sporadic violence in Tamil Nadu and Karnataka borders and the unsurprisingly insane show of loyalty by many of her followers – last I heard, 16 of her fans had committed suicide, apparently heartbroken at the ‘harsh’ judgement. When news like this surface, I’m reminded of the words of a acquaintance of mine. He, a top-level member of a political party, used to narrate stories of how, whenever news that tarnishes the image of their members come out, the party used to silently ‘encourage’ their gullible followers to create a scene, often by giving up their lives or fasting to death so as to make a statement. I remember laughing it off as an exaggeration then, but now that I think back, I don’t think he was joking. One of my Facebook friends had put up a post that gained much traction considering the current atmosphere. He wrote “People are terribly angry at the court for finding out that their leader stole a lot of money from them.” Fair enough. After all, the response to her conviction has been nothing but confusing. Keeping aside her supporters, the politically neutral diaspora has been reacting to the news with a mix of ‘justice prevailed’ and sympathy. The reasons for this are two-fold. One – she was, as far as Chief Ministers go, a pretty good one. In between all the gold and property she is said to have amassed, she is one CM who actually managed to try and give back to the poorer-than-poor section of her state with her rice for Re.1, Amma canteens, Amma school bags and her latest, Amma Cements. Of course, the choice of name did provide for a lot of amusing one-liners then and now, but it is an irrefutable fact that her schemes did go a long way in easing the pangs of being poor in TN. Another, and in my opinion, more prevalent reason for the sympathy towards her is the fact that she has been caught in the net of justice of which many of her contemporaries have eased through like slippery eels. In a country where politician is synonymous with corruption, it seems to many that Jayalalitha has been singled out and prosecuted, particularly in light of the upcoming elections. It doesn’t need a rocket scientist to figure out that the ruling could not have come at a better time for DMK, and, interestingly, to the BJP who has been, for long, looking for ways to weasel its way into South India and Tamil Nadu. It is no doubt that justice have been served. The idea that no politician, not even a CM, is above law is a comforting thought, especially to the Indian youth who are increasingly frustrated with the Indian politics. The lack of transparency has long hampered the enthusiasm of the youth, so much so that a mention of development is all that it takes to fire their bloods. By its brave judgement, the Indian judiciary has indeed set an encouraging trend. It has proven that justice delayed is not justice denied. Of course, it is naive to assume that just because the ruling is passed, Ms.Jayalalitha is going to spend 4 years in prison. The law is ridden with infinite loopholes and second-chances – no doubt her team of lawyers will find a way to bring her out. As often is the case, the ruling here is symbolic. Yet, this symbolism is a breath of fresh air to the citizens who are being starved of its faith in judiciary and the law. One can only hope that the wind of change would someday fondle the likes of Mr.Amit Shah who has, allegedly (aah..how I love that word! ), blood in his hands and yet holds one of the highest positions in the ruling party. But then again, money & development triumphs lives, so it is befitting that a case for corruption is viewed with much more seriousness than that of a ruthless massacre. “Bollywood. Puppets. Scandals. The never-aging superstar. The item girl. The love triangle. Super hit songs. Exotic locations. The spot boy. The stuntman. The casting couch. Bollywood Bandwagon has it all! 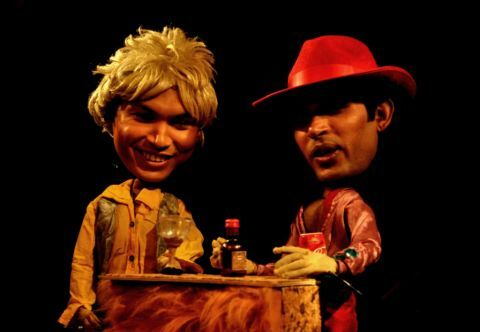 It is a hilarious comedy for adults, which is based on stories from Bollywood, presented with puppets and actors,” promised the BookMyShow page of Bollywood Bandwagon. It had been a long time since I last went to Rangashankara and Jo was also rather keen to watch a live play. Plus, we had both never been to a puppet show! So off we went – only to be joined midway by my other play-enthu buddy, Shyam (who, incidently was the partner in crime for The Open Couple too)! On the way, we were aided by a very helpful auto bhaiyya who first took us to the wrong place and on discovering that it was not where we had told him to take us, took us to the right location, absolutely free of charge. After this no-minor miracle, our mood was rather upbeat as we filed into the Rangashankara’s beautiful stage. I’ve this habit of unconsciously fidgeting when I’m excited and by the time the show started, I was a mess of twiddling thumbs and jiggling toes. And what a show it turned out to be! 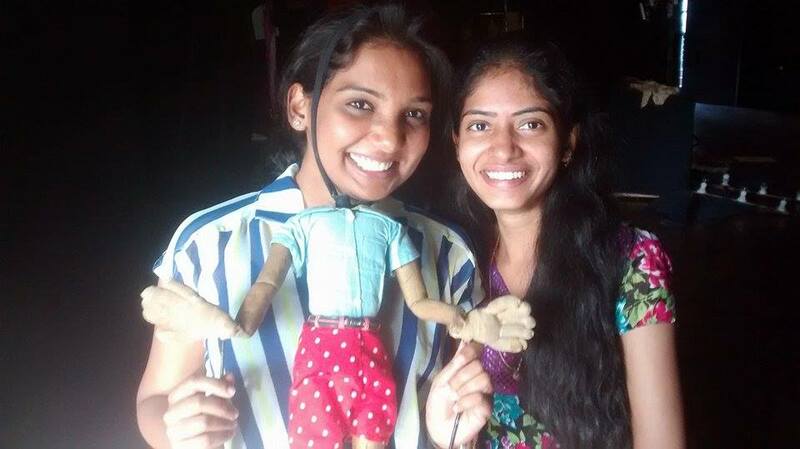 And this time, once the show ended, the Katkadha crew were sporting enough to let the audience take pictures and to interact with the crew and the puppets as well – one of the artists even let us take pictures with the puppets! The director of the show Ms. Anurupa Roy, is a postgraduate in History from Lady Shriram College, New Delhi. 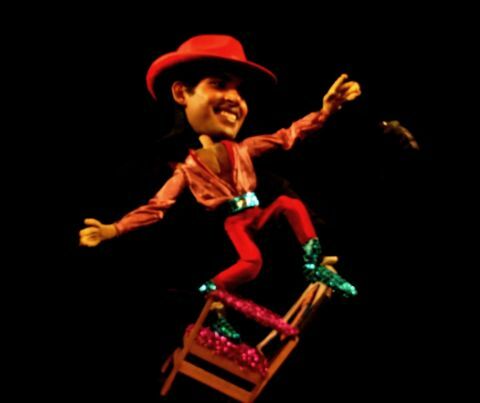 She is a puppeteer and a trainer and is one of the trustees of the Katkatha puppet arts trust. In between other things, she mentioned that she has been working on this particular act for the past 7 years! The Bollywood Bandwagon has just completed a tour of Switzerland and Austria and will move on to perform at Delhi from the coming Monday. It was a usual Saturday. Jo and I had spent the better part of the day debating over where we should got out for our ‘evening walk’. Now don’t let that fool you into thinking that by the end of it we had a solid plan – after all that discussion, the only thing we had agreed on was that we really need to ‘get something to eat’. After a few errands to that we had to see to, we decided that we are hungry specifically for burgers – you know how it is. I knew of this place called The Tuck Shop and Jo had never been there, so we decided that today was as good a time as to go there. Now came the tricky part. You see, I’d just been there once with a friend and being the geographically challenged person that I am didn’t have any idea how to get there. Not that we let THAT deter us. Armed with the address of the place, we attacked every passerby, requesting them to direct us. One of the directions was that we should pass in front of a Ganapathy Temple and it was while passing in front of it that we witnessed a beautiful Kathak performance. Needless to say, Jo and I were drawn to it, hunger all forgotten. We didn’t even care how out of place we looked, in our ratty jeans and tees! Before I go on, a word about Kathak. Kathak is the major classical dance form of northern India derived from the dance dramas of ancient India. The word kathak means “to tell a story” and the dance is famous for its graceful pirouettes, expressiveness and striking costumes. Of the two dancers performing that day, I found the movements and posture of one rather arresting as compared to other. With expressive eyes, subtle smile and high cheekbones, not to mention the incredible grace of movement, she was truly mesmerizing – so much so that we, who thought we’ll “see just one piece and go” stayed for the entire recital! So enthralled were we that we even plucked up the courage to go and let the artist, Ms. Simran, know how much we enjoyed her performance. As always is the case with great artists, she accepted our compliments with a graceful smile and when asked if she had been dancing for long (‘coz, frankly, I thought she was in her early 20s), replied, rather humbly, that she has been “for a while”. Just how humble she was I found out only later in the evening. Ms. Simran Godhwani (aka the graceful dancer) is, her bio tells me, an accomplished Kathak artist as well as Founder & Director of Krshálá – the performing arts school in Koramangala. She was an HR professional for four years in a leading MNC in Bangalore. She is a senior disciple of Guru Murari Sharan Gupta, who is one of the senior disciples of the legendary Kathak maestro Pt. Birju Maharaj & the artistic Director of Samam-Center for Movement. She is a principal dancer at Samam. 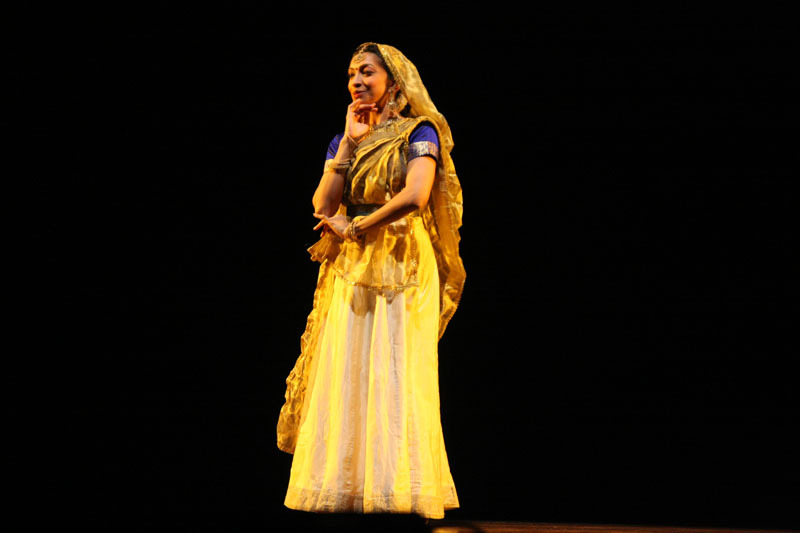 She learnt the classical dance of Bharatanatyam form for 17 years and Kathak for over 7 years. No wonder she is as good as she was! You don’t need to be a rocket scientist to know that it takes immense courage, dedication and hard work to succeed in performing arts and to actually make a career out of it – more so once you’ve known the perks of an MNC life. Especially in dance, which is often considered as nothing more than a frivolous hobby for girls in our society. As always, I am much moved and inspired by people like her who go on to do what THEY want to, oblivious to the society norms. More power to such passionate trendsetters! P.S: In case you are curious – Yes, Jo and I did manage to find our way to The Tuck Shop. And it was lovely. Though the food ain’t all that exceptional, the ambiance was worth the entire trip. 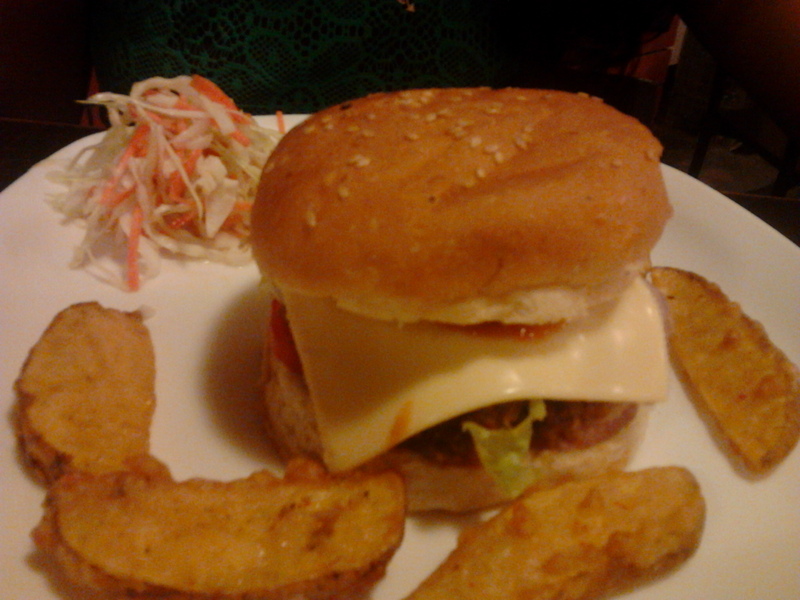 A decent meal for two can be managed under Rs.500. I’d recommend that you check it out! My choice for the evening – ‘Oh Basanti’. Yeah yeah, I choose food based on their name. The menu card that I kinda loved! Posted on September 28, 2014 September 28, 2014 Categories Art, Bangalore, Dance, Food, TheatreTags Bangalore. 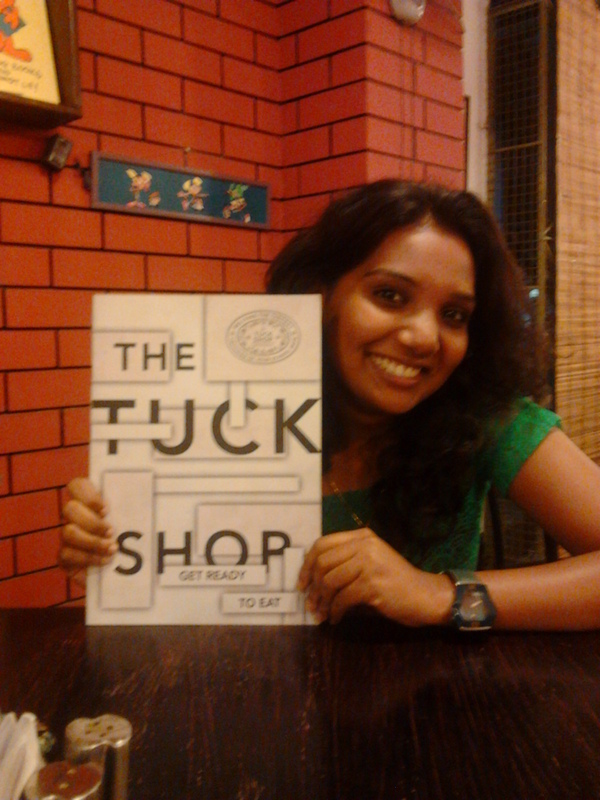 Thrissur, burger, dance, food, kathak, Kormangala, Krshala Dance Theatre, Simran Godwani, The Tuck Shop, walk6 Comments on Unexpected Kathak treat! As often is the case, I found The Painter of Shanghai by pure chance. I had lent my library card to my roommate because she was utterly bored and wanted to walk it off and had no place to go except the nearby library. So off she went and when she came back, she had this book clutched in her hand. Though I didn’t say anything just then, I was secretly disappointed at her choice. 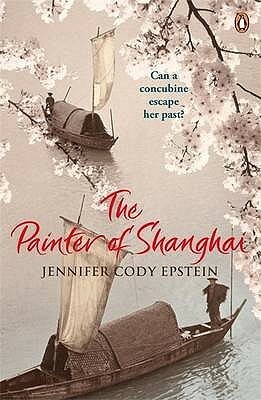 I had once tried reading ‘The Memoirs of Geisha’ and was unable to enjoy it even slightly, so the description of ‘Can a concubine escape her past?’ didn’t exactly inspire confidence. Which explains why this book was left untended to for about 2-3 weeks before lack of alternate reading materials forced me to pick it up. 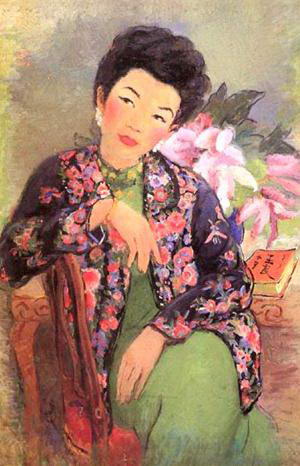 As always, Pan Yuliang’s remarkable legacy was honored in the way it should be much after her death in 1977. However, even today, her nudes continue to cause controversy and furore – in 1993, an exhibition of her work in Beijing caused enough concern that several of her nudes were removed. After all, it is not in vain that the famous French artist Henri Matisse once remarked “Another word for creativity is courage”. 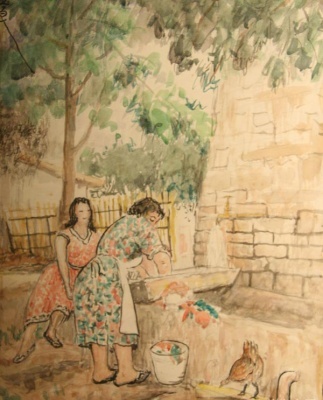 Driven by curiosity, I managed to locate a few of Pan Yuliang’s works – ‘The Lingnan School’s‘ site offers much more insight to her artistial journey. I’ve attached two of my personal favourite paintings of hers’. At Thrissur, the place I hail from, there is a place called the Regional Theatre. It is one of the many cultural hubs in the city of Thrissur widely known as the Cultural Capital of Kerala. Also it is barely 5 minutes away from my home. Hence it is a matter of colossal shame (to me personally) that the first play I ever saw was after I came to Bangalore – a month or so back, to be precise. It was a wonderful experience and it certainly moved me enough to decide that I’d be back to theatre many a time in future – a promise I was not able to make good of until yesterday. On Sunday, a friend and I decided to go to a play called “The Open Couple”. I had been harping on about how Bangalore’s cultural strength is overshadowed by its bright new malls and discotheques (not that I’m against it!) and it is perhaps to gain momentary relief from this that he came up with this idea. Besides, there is something exhilarating about paying 300 bucks to watch a play as compared to spending the same amount for watching a less than decent (and often downright crappy, IMHO) movies, don’t you think? So back to our play. The Open Couple is a satirical English play written by Nobel Prize winner Dario Fo and his wife Franca Rame in 1983 and is directed by Faraz Khan who was recently featured in Anand Gandhi’s Ship of Theseus. It revolves around the life of Antonia (Vaishali Bisht) when her husband, referred to as ‘The Man’ (Anuj Gurwara) decides that he is bored of their normal married life and proposes that they be in an open relationship. The play opens with Antonia as a suicidal emotional wreck and through a series of funny, poignant vignettes, concludes with a complete role reversal. The play is nothing like you expect it to be. For one, the first thing I noticed when I got inside the hall was that there was a commode at the center of the stage. Just a commode and no other furniture except for 2 wooden stools. Also the troupe uses painted faces and includes some miming techniques and several exaggerated body movements to convey the ridiculousness of certain situations. It goes without saying that the two actors have done a wonderful job of portraying Antonia and The Man, especially the adorable Italian accent – so much so that I actually thought that the actors were of Italian origin! (Of course, this was a source of great humour to my friend!) It was only after I got home and Googled the play that I realized that the actors are rather acclaimed in the theatre world. Vaishali Bisht, Google tells me, is a graduate in theatre and drama studies from the University of Kent in Canterbury, England and Anuj Gurwara is an active theatre actor in Hyderabad and has worked in films with directors like SS Rajamouli, Sekhar Kammula and Nagesh Kukunoor.